You will find below the horoscope of Julia Lautowa with her interactive chart, an excerpt of her astrological portrait and her planetary dominants. If you know the time of birth of Julia Lautowa, we would appreciate it if you would send us your information with your source, at stars@astrotheme.com. To thank you for contributing to the enhancement of our astrological database, we shall be glad to send you the astrological portrait (34 pages) of this celebrity. Horoscopes having the same aspect Mars trine Neptune (orb 1°42'): Angelina Jolie, Jean-Marie Le Pen, Michelle Pfeiffer, Françoise Hardy, Russell Brand, Paul Newman, Frédéric Chopin, Kesha (singer), Jimmy Page, François Mitterrand, Robert Smith (musician), Jean-Paul Sartre... Find all the celebrities having this aspect. Celebrities clicked on in real-time: 577,074,392 times. Julia Lautowa (born October 5, 1981 in Moscow) is a figure skater who competed in ladies singles. She was born in Russia but moved to Austria and competed for them internationally. She was briefly married to Roman Kostomarov. Here are some character traits from Julia Lautowa's birth chart. This description is far from being comprehensive but it can shed light on his/her personality, which is still interesting for professional astrologers or astrology lovers. 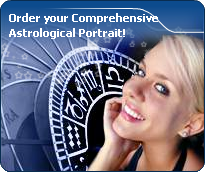 In a matter of minutes, you can get at your email address your astrological portrait (approximately 32 pages), a much more comprehensive report than this portrait of Julia Lautowa. Warning: when the birth time is unknown, which is the case for Julia Lautowa, a few paragraphs become irrelevant; distributions in hemispheres and quadrants are meaningless, so are dominant houses and houses' accentuations. Therefore, some chapters are removed from this part. Cheers for communication and mobility, Julia Lautowa! The predominance of Air signs in your chart favours and amplifies your taste for relations and for all kinds of short trips, whether real (travels) or symbolic (new ideas, mind speculations). You gain in flexibility and adaptability what you lose in self-assertion or in pragmatism. The predominance of Water signs indicates high sensitivity and elevation through feelings, Julia Lautowa. Your heart and your emotions are your driving forces, and you can't do anything on Earth if you don't feel a strong affective charge (as a matter of fact, the word "feeling" is essential in your psychology). You need to love in order to understand, and to feel in order to take action, to the detriment of a certain vulnerability against which you should learn to fight. Julia Lautowa, the Cardinal mode is dominant here and indicates a predisposition to action, and more exactly, to impulsion and to undertake: you are very keen to implement the plans you have in mind, to get things going and to create them. This is the most important aspect that inspires enthusiasm and adrenalin in you, without which you can grow weary rapidly. You are individualistic (maybe too much?) and assertive. You let others strengthen and improve the constructions which you built with fervour. After this paragraph about dominant planets, of Julia Lautowa, here are the character traits that you must read more carefully than the previous texts since they are very specific: the texts about dominant planets only give background information about the personality and remain quite general: they emphasize or, on the contrary, mitigate different particularities or facets of a personality. A human being is a complex whole and only bodies of texts can attempt to successfully figure out all the finer points. Your sensitivity is withdrawn, Julia Lautowa: more than anyone, you tend to lock yourself in your ivory tower, as you are aware of a kind of superiority that may be real, though overrated. Your moods are not perceptible because you control them with a tight fist. It is difficult to know if you are happy or upset because you show nothing. You avoid situations which compel you to reveal your emotions because you are not demonstrative. Please, be aware that it is not your amorous behaviour that is being analyzed, but the daily expression of your sensitivity. You dread the crowd and you need calm, and even solitude, to feel comfortable. You are well-equipped to remain balanced in all circumstances, but it may prove beneficial if you progressively take a relaxed attitude and show more dedication, as you are worth it; it is easier for you to exteriorize your feelings when your projects or your ambitions justify that you do so. You do not practice gratuitous outpourings, particularly when your are with a group, because you are afraid to open up, as if you were on the defensive, without any reason most of the times. You are the very type of the researcher endowed with great intellectual and imaginative capacities, Julia Lautowa, and your curiosity is very deep. Researches, riddles and mysteries appeal to you and with a remarkable sixth sense and intuition, you endlessly try to unearth the truth, in all areas, like a psychoanalyst or a detective. You are a very secretive and introverted person, you find it difficult to open up and you rather prefer psychoanalysis. In spite of your clear-sightedness, you find it hard to deal with people: your critical mind, tinted with irony and causticity, may be destructive, especially since your determination and your stubbornness do not incline you to giving up. You are fond of provocations and you handle contradictions skilfully even though you may come across as dishonest. You cannot dissociate love from passion, Julia Lautowa. Your feelings are immediate, imperious, intense, and it is absolutely impossible for you to think of an amorous relationship without fusion, without the irresistible desire to know everything about your partner: emotions, feelings, sexuality, everything must be experienced in a possessive, absolute and unrestricted way. Actually, your feelings are as complex as they are deep. You seldom love, but when you do, a burning ardour and its torrid, violent frolics consume your couple. It is obvious that such powerful feelings may lead to jealousy and absolute exclusivity, almost bordering on the will to control your partner. If your relationship is genuine, all is fine. But if it is not the case, there are real dangers of shared wounds within your couple; it is hard to reconcile passion with tranquillity and it is clear that for you, sentimental serenity involves a partner who is either as complex as you and who instinctively understands you, or who is complementary, and as calm and steady as your impulses are intense and deep. What an energy, Julia Lautowa! You take so many initiatives, you have so much strength for action, construction and struggle! You are part of the conquerors, loyal and concerned about panache. Your vitality is such that you can achieve your objectives and release all your creativity. However, you are so proud and so unyielding that you cannot tolerate the faintest annoyance on your way: if you are vexed, you may turn into the opposite direction as a matter of reaction. Sexually, your magnetism and your energy work wonders. You are not complicated and, as long as your slightly domineering nature is respected and you are granted due admiration, all goes perfectly well. You usually have a lot of self-confidence and you believe in you. This characteristic feature may turn you into a hero with Hercules's strength and solar charisma. This text is only an excerpt from of Julia Lautowa's portrait. We hope that it will arouse your curiosity, and that it will prompt you to deepen your knowledge of astrology, as well as to visit and use the wide range of free applications at www.astrotheme.com.